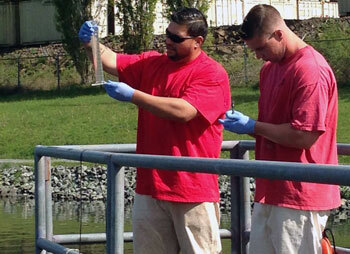 Keone Padilla (left) and Dylan Ryan, inmates incarcerated at MCC, test samples from the prison's wastewater treatment lagoon. Photo by: Susan Biller, MCC PIO. MONROE — Keone Padilla’s path to redemption lies through sewage. Each day, he leaves his prison cell and heads down to the Monroe Correctional Complex’s wastewater lagoon. It’s his job to help guide 350,000 gallons of raw sewage through a complicated treatment process before it’s pumped into the City of Monroe’s sewer. There’s a lot that goes into turd herding, as they call it in the wastewater business, including regular testing and tinkering with chemistry to ensure proper treatment. Padilla’s hands–on training, and college correspondence coursework, have earned him a Group 1 certification from the Washington State Department of Ecology. Padilla believes it’s his ticket to a good job when he’s released in a year, and there’s reason for optimism. The wastewater treatment industry has an aging workforce that’s retiring in droves, and several inmates from Monroe and other prisons have already gotten jobs in the tight labor market. There’s more to this than just training for a new job, though. “I don’t have the best or brightest background,” said Padilla, who’s served more than five years in prison for multiple property crime convictions. “I’ve committed a lot of crimes and done a lot of drugs and other things that led me to prison and I’ve made a lot of poor choices in my life. That somebody was Jonathan Jones, a former inmate at Monroe who also earned his initial wastewater treatment certification at the prison. Jones, who landed a job with the City of Edmonds shortly after his release, persuaded Padilla to follow his footsteps. Jones said he wants to convince other inmates to follow suit. Six DOC prisons operate their own waste water treatment facilities. In addition to Monroe, the Larch, Cedar Creek and Olympic correction centers are also training inmates at their treatment plants. Charles Shoop, a maintenance mechanic who supervises inmates at Monroe’s wastewater plant, said seven inmates who earned Group 1 certification during his tenure have landed jobs within a week of leaving prison. Pretty much everybody who gets certification and wants a job is able to get one, he said. That’s not true for most inmates released from prison in Washington. Roughly 31 percent of inmates found jobs after release in the third quarter of 2014, according to the most recent figures available. That number does not count inmates enrolled in college. The inmates can make anywhere from $19 to $29 an hour in the wastewater industry, depending on which certification level they earned while in prison, Shoop said, noting they can earn much more than that after a few years in the field. In addition to benefitting from a labor shortage in the wastewater treatment industry, MCC inmates also have a leg up over competition because they actually maintain the prison’s nearly four acres of sewage lagoons. “The odd thing is, you can’t get certified unless you’re actually doing it (working at a treatment facility) on a daily basis,” Shoop said. Inmates interested in getting certification have to spend $115 of their own money to enroll in a University of California correspondence course, and purchase course materials. Padilla teaches free classes to guide inmates through the certification process. There are currently 25 inmates enrolled in his 15-week course, and a waiting list to get in. Dylan Ryan, 23, is one of the inmates who made it through Padilla’s course and is now working at the wastewater lagoon trying to get his Group 1 certification. “He (Padilla) convinced me to come into the class six or seven months ago. And I have stayed in the books and have progressed fast. I’m already about to take my exam,” Ryan said, who’s in prison on a robbery conviction. Padilla, Shoop and others at Monroe said they’d ultimately like to see the training ramped up to the point that 25 inmates a year could earn their Group 1 certification before being released. While learning the science of wastewater treatment and earning certifications are crucial to getting a job, inmates in prison also have more basic skills to master, Jones said. When he went for his job interview at the city of Edmonds, he was asked tough questions, such as whether they needed to worry about his criminal background and “How do I know you’ve changed? Are you going to go crazy and do something stupid? “There were all these questions that guys (at prison studying wastewater treatment) are going to have to come to grips with,” said Jones, who served time for an assault conviction. Inmates also have to work on their social skills, he said, noting that wastewater treatment operators typically are pretty isolated and need the ability to work together with someone for long hours. “They are going to want to small talk about family. If all you’ve got to talk about is prison, they’re not going to want to hear about that,” Jones said. He noted that MCC has Ready to Release classes that helped him prepare for the outside world. Padilla, for his part, says he’s ready to take the next step into a new career. This story was also featured on KING5. You can visit the KING5 website to read their article.